From the Editor: This posting comes from new user Origins4. He originally left it in a comment on the Final Crisis TPB. 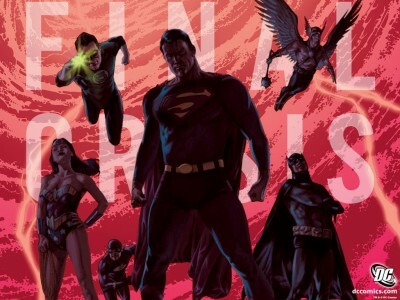 Hopefully I’ve helped him with a little direction on the forums, which are still under development, and I thought it would be nice to share his Final Crisis reading order with everyone. This reading order is a condensed one focusing on the primary event itself. I’ve made a couple formatting and content changes to fit it in with the rest of the Comic Issue Reading Orders, but the credit for this goes directly to him. Enjoy! Hi, I’ve been using the site for some weeks and have now registered. I’ve never been too internet savvy, and my attempts to start a new topic in the forums for a final crisis reading order failed. So, I hope this helps someone. I know some people read Batman 682-683 before Final Crisis 5 because FC5 ruins the surprise. And I’ve seen one reading list that switches Rogues’ Revenge and Requiem, putting Revenge after FC1 and Requiem after FC2. When I start reading I’ll see how it goes. I recently got the Final Crisis Companion (the last book I needed to complete my Final Crisis collection), and I’ve been re-reading the series and following this list (I’m about to start Revelations), and so far this list looks great. Unfortunately, my copies of Seven Soldiers of Victory are on loan to a friend, so I was not able to read those first; I was amazed at how much that series set up for Final Crisis though. I think Requiem makes the most sense immediately after Final Crisis #1, and Rogue’s Revenge does make sense building off of Libra’s gathering of the villains. I did skip R.I.P. because I recently re-read the Batman run leading up to it (I’ll still read Last Rites, and since I only collect trades, I don’t have DC Universe #0 (which is a shame, really, since I started reading the post-R.I.P. Outsiders, and that plays a significant part with Geo-Force).